Biography: Dr Maggie Atkinson is the second post holder in this vital role, which enables her to promote and protect the rights of the child, and to encourage children and young people, families, opinion shapers, policy makers and practitioners to join her. After a 35-year career working with and for children and young people, she is a fearless defender of their entitlement to be valued and heard as young citizens making positive contributions to the society in which they will, in their turn, become adults. Maggie has led the Office of the Children’s Commissioner in a period when its influence has continued to increase, leading to positive changes in the life chances of England’s children and young people, especially the most vulnerable and marginalised among them. Her office’s small team has helped to prompt policy and practice changes for asylum seeking and refugee children, children in contact with social care, the family courts and other vital services, those excluded from school, in conflict with the law, or struggling with mental and emotional health difficulties. She is now leading the Office of the Children’s Commissioner through the strengthening of its role and remit that will follow from legislative change being made during 2013-14. She is a member of the Department of Health’s Children and Young People’s Health Outcomes Forum, with a particular focus on challenging England’s many social inequalities and their negative effects on children’s health. Maggie is a Cambridge graduate. Training at Sheffield University, she was a secondary school teacher of English and Drama, including leading a high school department, before working on a National Curriculum English Language initiative and then in training, inspection, school and service improvement in local government. 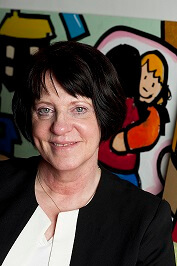 She was the first Director of Children’s Services for Gateshead during radical changes following the Children Act 2004. During her six years there she was the first solo President of the Association of Directors of Children’s Services (ADCS) in 2008-09. Maggie graduated as a Doctor in Education (EdD) at Keele University in 2008 and is now an Honorary Professor there. She was awarded an Honorary Doctorate of Civil Letters (DCL Hon Causa) from Northumbria University in 2010.